Accelerate is a tea based fat burner that improve metabolism, helps control blood sugar, appetite suppression, and promote energy levels*. Clinically proven to help you burn fat three times faster. It rapidly and effectively boosts your metabolism, significantly decreases body fat, and trims your waist line, leading to faster, noticeable results*. Would you like to order just an Accelerate supplement and not whole weight loss package? Not problem. Choose your preferred option and enjoy its benefits. 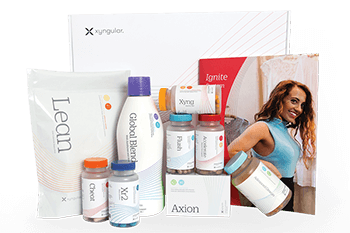 Do you have more questions about Xyngular’s metabolism booster Accelerate? Read more and find everything what you need to know before buy. How do you recommend using Xyngular Accelerate? We recommend taking 1 accelerate mid-afternoon with food. Accelerate is best taken in the morning. Do not take Accelerate in the evening. Can I take Accelerate with my medication or condition? What makes Accelerate different from other thermogenic products? I don’t like tablets. Can I crush the tablets? Yes. The effect of Accelerate will be more immediate when the tablet is crushed. How many softgels are in each bottle of Xyngular Accelerate? 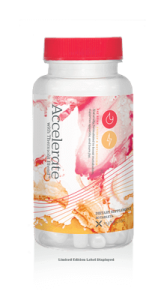 Does Accelerate contain caffeine or stimilants?